This is the eighth book I read for the Pay It Sideways Challenge. 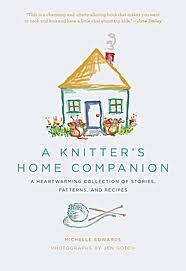 I’ve been knitting on and off since I was a teenager and have been looking for a book about knitting for a long time. I have a number of knitting manuals and pattern books, some with a bit of history mixed in, but what I really wanted was a more personal, warm and fuzzy book that would induce the same feeling I get from sitting down with a nice long pattern. When I read this review by Book Snob, I knew I had finally found what I wanted! To start with, this is a very beautiful book, filled with simple but lovely illustrations by Michelle Edwards herself. Straight away, you can tell that it’s going to be a heart-warming and relaxing experience reading through the pages. It’s a collection of short stories and essays, with the odd recipe, book recommendation and of course, knitting pattern dotted between them. This is a carefully written book separated into four main sections; ‘Motherhood’, ‘Home’, ‘Community’ and ‘Legacy’. Knitting has always been a big part of Michelle’s life and every memory seems to be linked with a knitting pattern, a special yarn or a particular problem to be worked out. The stories are charming, telling of everyday family life, close relationships and lessons learned (about knitting and life!) The stories that most interest me are the ones about previous generations and how and why they knitted. Michelle’s patterns for baby blankets and bibs are probably ones that I will come to in the future. However, there’s plenty to keep me going for the present. Michelle has encouraged me to think about knitting an afgan – although I might try the simple mittens first! And I can’t wait to make some boiled egg warmers! If knitting is more than just a hobby for you, this book is a lovely companion to pick up when you’re in need of some encouragement, or just a charming story. Click on the picture below to buy it!